I’ve just looked back at a paper I wrote for a symposium in 2004. 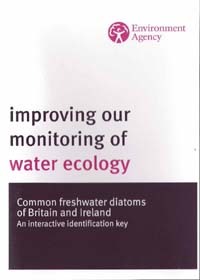 It described a CD-ROM I was helping to develop at the time for the UK’s Environment Agency, to help their analysts to identify diatoms. The tone of the article is upbeat and positive, eulogising the potential for interactive CD-ROMs for identification. So much for that. The Environment Agency has just deleted our key from their publications catalogue. In so doing they fulfil one of the prophecies in my paper. The software, quite simply, evolved faster than we were able to respond. We had a bold vision for a modular project, developing from a first release with about 300 common diatoms found in rivers into, eventually, comprehensive coverage of all diatoms found in Britain and Ireland. We had recognised, too, that the software would have to evolve to keep track of other developments in hardware and software. However, within about a year of the release of the CD-ROM, the Environment Agency’s priorities shifted and (more significantly) funding became much tighter. Funding for the additional modules never happened. More importantly, there have been changes in the licensing agreement for the software that we used to develop the key which means that our package would need to be modified if it were to be sold as a user-friendly entity again. The publications team at the Environment Agency did not consult us before deleting the CD-ROM but, even if they had done, I doubt that there would have been funding available to cover the time needed to upgrade the package. This saga illustrates some of the pitfalls of using new media. I have, on my bookshelf, a facsimile edition of Frederich Hustedt’s flora of freshwater diatoms from central Europe, first published in 1930. Many of the taxonomic ideas are now out of date but the illustrations and descriptions are still useful, 86 years after firs publication. By contrast, our CD-ROM was obsolete within a decade. The whole idea of a CD-ROM, indeed, sounds rather quaint in 2014 and, to emphasise the point, I am typing this post on a laptop which does not have a CD-ROM drive. The latest versions of the Lucid software are aimed at online keys and the prospect of using an iPad or even a mobile phone as a platform for identifying organisms is tantalising (and ,indeed, already possible for some groups: see the Field Studies Council publication website). The same issues about upgrading and maintenance will apply as much to a website as to a CD-ROM. As soon as I stop paying my subscription, my own websites will disappear, along with all the information stored on them. Large institutions such as the Environment Agency and national museums ought to be more resilient but I fear that it would only take a small shift in an organisation’s priorities or a change in key personnel for an active website to become fossilised or archived. The good news is that all of the information except the keys themselves are available on the web, courtesy of Steve Juggin’s website at Newcastle University and that there are plans to develop a new online diatom flora of Britain and Ireland, hosted by the National Museum of Wales. And, of course, if all these fail, I will still have my trusty copy of Hustedt’s Flora. One aspect of the CD-ROM that will not be missed: the grim cover of the CD-ROM. Not a single diatom in sight. Kelly, M.G., Bennion, H., Cox, E.J., Goldsmith, B., Jamieson, B.J., Juggins, S., Mann, D.G. & Telford, R.J. (2006). An interactive CD-ROM for identifying freshwater diatoms. pp. 153-161. Proceedings of the 18th International Diatom Symposium (edited by A. Witkowski). Biopress, Bristol. This entry was posted in Uncategorized and tagged CD-ROM, diatom, Environment Agency, identification. Bookmark the permalink.